This report responds to key concerns highlighted by the National Round Table on the Environment and the Economy (NRTEE) in its 2007 Response to its obligations under the Kyoto Protocol Implementation Act (2007 KPIA Response). Chief among those concerns were differing and inconsistent forecasting methods used among various federal departments to describe the greenhouse gas (GHG) emissions reductions accruing from a particular policy measure or initiative, leading to issues of additionality, free ridership, rebound effect, and policy interaction effects. 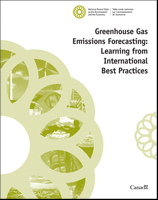 The NRTEE emphasized the importance of transparency and clarity with respect to key assumptions and methods, and the consideration of important sensitivities and uncertainties when producing GHG emissions forecasts. It also emphasized the importance of consistency in approaches across different departments, programs, and measures, and the need to integrate the findings in a holistic framework. In light of these concerns, the NRTEE felt it could be useful for the federal government if international best practices could be identified and highlighted in the forecasting of emissions reductions resulting from government policies, from both a methodological and a governance perspective.